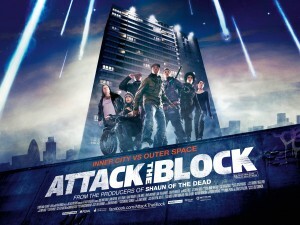 ?Attack The Block Attacks The Flock!? A new director?a new DP?eleven new actors?and a whole new shift in British-made scifi horror comedy. 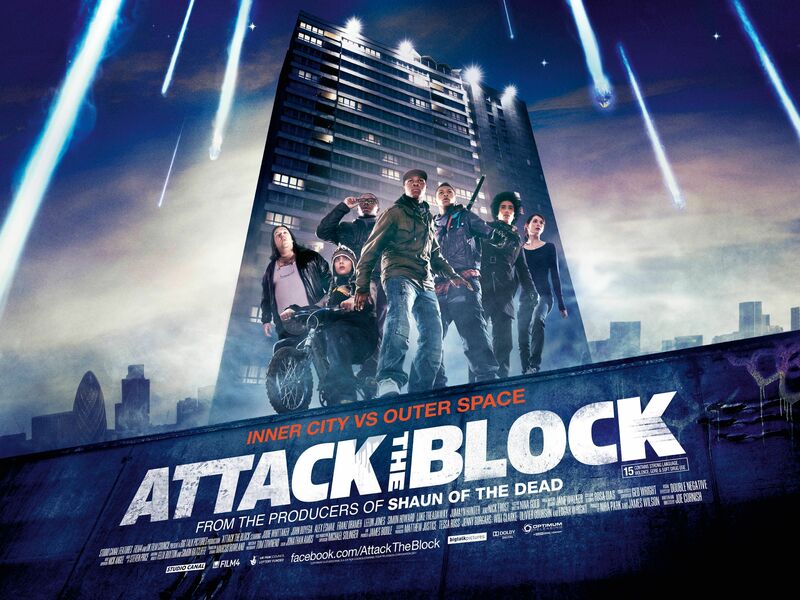 Joe Cornish, best known for his Channel 4 and BBC 6Music partnership with Adam Buxton, absolutely smashes the movie industry a new one with his debut feature ?Attack The Block?. The film comes from the Edgar Wright/Simon Pegg studio Big Talk, and is about as British as you can get, but about as far from the sappy, romantic stylisation of Working Title films like ?Notting Hill? as it is possible to be. The plot in a nutshell ? a gang of 15 yr old hoodie kids on a South London (Brixton/Oval/Kennington/Stockwell area) high-rise estate come face to face with a pack of rampaging alien beasts and are forced to defend their ?block? from these vicious ETs. Along the way they mug, save and are saved in return by a newly qualified nurse, and try their best to hide out with their drug-dealing mate and avoid being shot by the block?s gang-leader. Sound complicated, it is but yet it is incredibly easy to watch?and to enjoy. I won?t say anymore because I really don?t want to spoil the movie for you. Down to the nitty gritty?the aliens?any good? Well, they are unique. They have glowing teeth and no eyes, and I would swear they are performed by men in monster suits?or maybe one man in a monster suit and then CGI?d to look like a pack? Whatever, the beasts are fast, feral and out for blood. They are a great creation and their reason for being on Earth and attacking the block is not revealed until almost the very end of the film (how refreshing is that?) Joe does a good job of putting the scares in the right places, but then shifting them a few seconds later (or earlier) than you might expect. When there is violence, it doesn?t hold back. And remember, we?re talking about a gang of kids here?most films would shy away from showing too much violence where kids are involved, but not this movie. The horror and gore are perfectly dealt with, not too little nor too much. Just enough for gore-hounds to enjoy, but not so much it?ll put non-horror fans off. The genius of this film comes from two directions. First, the script. Joe has written a true modern scifi horror comedy. I fear few people outside of the UK will understand a lot of it?come to that, the sheer amount of ?kid street-speak? 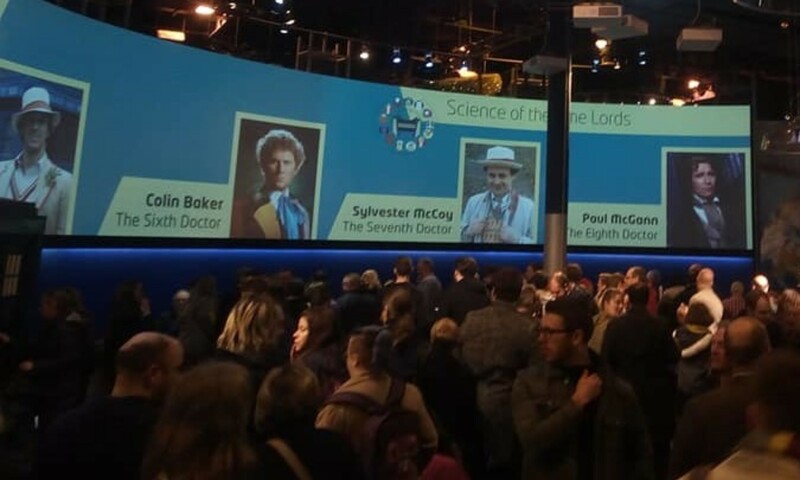 may be hard for many from the UK?but even if this is so, the words explode off the page and it is testament to an incredibly talented group of inexperienced actors (alongside the likes of Nick Frost and Jodie Whitaker) that you are soon following it all and working out just what the heck it is they are saying. Within this world of street language and mugging, gang culture and notoriety, you start to understand what kids like this are going through in today?s high-rise/estate world. Layered throughout the film is an infectious and, frankly, ridiculously funny streak of humour. Yes there is horror, yes there is violence, but the comedy is well-timed, well-written and just enough to make you care about the characters. I said two things?so here?s the second?the location. All great horror films work because the heroes are stuck in a locked, small environment. Here we find our gang of kids, and everyone else for that matter, fighting off the alien invasion within the confines of a South London tower block. Everything occurs within the block, under the block, on the outside of the block or within a minute of the block. The aliens are here, but this is no world-wide invasion, they are targeting this one block, right now! The location is extremely British. It is somewhere that evokes fear and darkness and sadness and decrepitude. You see each of the kids once as a hard nut gang member, but again within their flats as something entirely different. The building starts as somewhere many of us would be fearful of going, but by the end it has become as much a hero as the kids. A big nod to the DP who pulls off some startling shots of the block and the surrounding streets?I can?t wait to see it on BluRay! There is so much I want to tell you about this film, but I can?t as that would spoil the experience for you. I can tell you that Joe has pulled off something incredible here. I hate management pseudo-speak but for once the term paradigm-shift feels like the right thing to say. This is a fantastic science fiction film, an iconic horror/monster movie, a thoroughly original British comedy?and yet, walking away, it wasn?t the beasts or the SFX or the shots of the block that lingered in my mind, what I was thinking about was the sub-text, that inner-city and deprived kids today feel like they are under attack, they won?t be listened to or cared about by the authorities, that the police are more like ?Feds? than friendly bobbies. In Joe?s film it may be monster?s attacking the block, but in the real world, for many kids, they and their blocks feel equally under attack. It?s no wonder so many turn inwards, form gangs, look to local drug lords, and worse, to feel a sense of belonging, togetherness and protection. If the world is attacking their block, they?ll fight back! Congrats to Joe and his DP and the entire Big Talk crew for being the first film in many years to surprise me, and show me something I hadn?t seen before. The rumour is they made this masterpiece of scifi horror comedy for just $8million. Just goes to show you, Hollywood, what more emphasis on original writing and seeking out new talent can get you. A few less remakes and sequels and lot more Attack The Blocks would do us all very nicely, thank you. ?Attack The Block? has, for me, kicked the sheep-like dross squarely up the backside, and I for one am looking forward to Joe?s ?awkward second album? ?how about Adam & Joe: The Movie with a Baaaad Dad mini-movie to open?